Get your plan for financial peace at this one-night event! If you’re tired of living paycheck to paycheck and wondering where your money is going, Smart Money is where you’ll get the answers. You’ll get the basics of budgeting, why it works, and how to apply to everyday life. If you know Dave’s principles but you’re having trouble putting them into practice, Smart Money will give you the extra motivation you need. Reset the plan for your family and get back on track! If you’re already seeing success with the 7 Baby Steps, Smart Money will keep you encouraged and ensure you continue down the right path. There’s so much more to life than fighting to pay the bills. Experience the plan that has helped millions of people around the world get and stay out of debt and retire with dignity. It’s time to break the cycle. It’s time to live more and worry less. 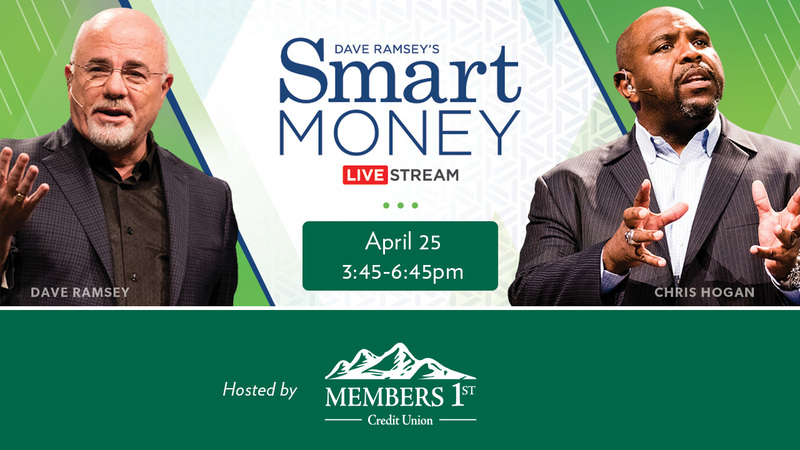 Join the credit union at our Hilltop Branch (1380 Hilltop Drive, Redding) for this special Live Stream event from Dave Ramsey and Chris Hogan.